A version of this review appears on kevchino.com. 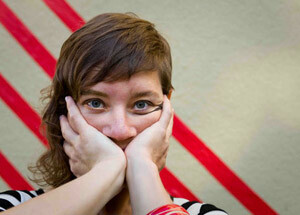 Merrill Garbus, the singular voice behind tUnE-yArDs, is never in better company than with herself. On the band’s latest album, w h o k i l l, Garbus is by turns a chorus, a conversation, and about half the instruments on the record, her voice squeezed and cut and looped over itself again and again. Set to a clamorous, snare-drum-heavy beat, the songs are striking in their directness; Garbus, for all her talkativeness, never wastes a breath. Until recently, tUnE-yArDs was a one-woman band, complete with delay pedal, ukulele, drums, and Garbus’ own elastic vocals. Add bassist Nate Brenner, a horn section, and a whole lot of editing, and you’ve got w h o k i l l, a noisily intricate record pulsing with African polyrhythms and the clatter of sticks against drumhead. Garbus’ 2009 debut, BiRd-BrAiNs, was a feat of lo-fi, DIY resourcefulness, and w h o k i l l revels in the possibilities opened up in the studio with a few fellow musicians. Garbus—whose music borrows much from her time spent in Kenya as a college student—yelps, bellows, and croons her way across a rich soundscape that owes as much to clever production as it does to African rhythms and singing styles. Like rising scaffold towers, the songs assemble themselves piece by piece, Garbus’ throaty vocalizations flitting through layers of jumpy percussion and tripping over the crackling shards of themselves, fractured and reintegrated into the vibrating sonic milieu. Despite the music’s complexity, Garbus never seems to get lost in it; even with all that detail, she still has space to play. On w h o k i l l, Garbus draws you in but never lets you get too comfortable. She has a penchant for catchy tunes punctuated by jarring melodic movements, and for lyrics that surprise and disturb. The opening track, “My Country,” begins with the familiar strains of “My Country ‘Tis of Thee,” the sing-songy first lines set to an insistent, syncopated beat. The lyrics then abruptly change tack, as Garbus sings, “How come I cannot see/My future within your arms?”, and the song spirals into a thundering, disaffected anthem. Throughout the album Garbus grapples with such heavy subjects as identity, body image, violence, and oppression, but she somehow manages to do this without preaching, letting poetry and the complexity of her feelings speak for themselves. Like the title of the album, Garbus’ songs sound as though they were yanked out of the middle of a sentence, a menacing imprint all that’s left of a fully-articulated idea. The lasting impression, though, is not one of anger but of exhilaration—more than anything, Garbus knows the raw, joyous power of her own voice. This entry was posted in Uncategorized and tagged indie-rock, music, pop, review. Bookmark the permalink.